Another paper has come out similar to the Atzmon work reviewed in my previous TOO paper. Having exhaustively examined Atzmon’s study, and seeing that the new Behar work (“The genome-wide structure of the Jewish people“) essentially says the same thing, I’ll keep the comments brief. I have also written the current TOO article (“Jewish Ethnic Genetic Interests“) as a dialogue on the complex topic of how to think about Jewish ethnic interests. Comments on these articles are welcome. The Dienekes blog does a good job summarizing the paper, so I’ll highlight the major relevant points. 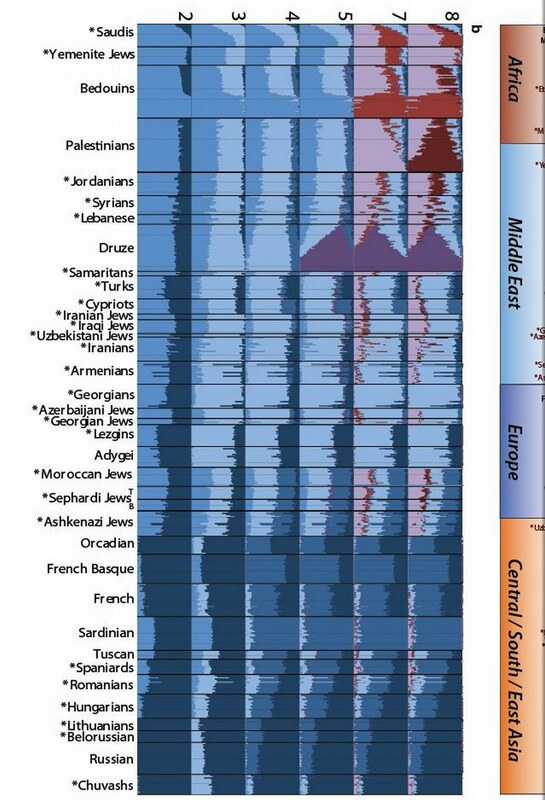 Global “admixture” analysis, similar to Atzmon’s Structure data, shows the Ashkenazi as similar to other Jewish populations (and to Cypriots) and roughly midway between Europeans and groups like Palestinians. Another view is here. 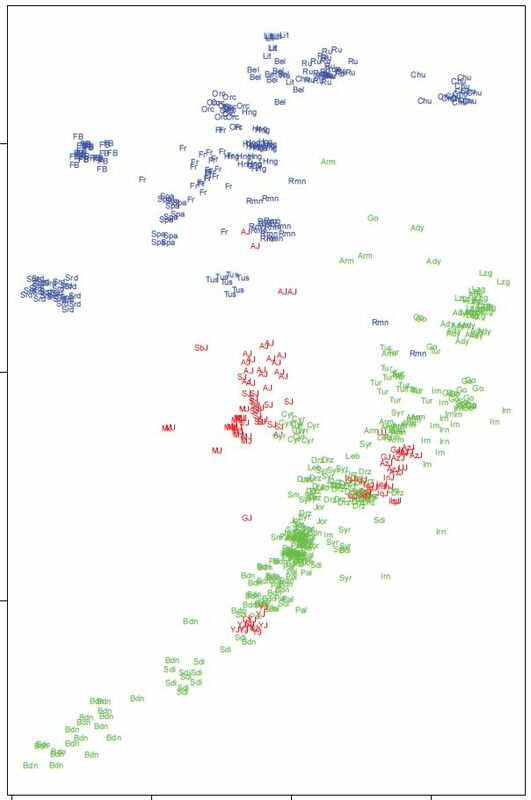 The regional “admixture” analysis again shows the intermediate nature of Jewish populations and their greater similarity to Middle/Near Easterners than to Europeans. Most Jewish samples form a remarkably tight subcluster that overlies Druze and Cypriot samples but not samples from other Levantine populations or paired Diaspora host populations. Therefore, this statement suggests that Jews are not Middle Eastern (“other Levantine populations”) nor European (“paired Diaspora host populations”) but a separate population in between. However, they seem to be basing that statement on the PCA, which is not reliable. However, as the “admixture” analysis yields the same “in between” ancestry profile, the statement itself is probably sound. Note that it mimics Atzmon as well as other previous studies on this topic reviewed here in the past. The positioning of the Ashkenazi-Moroccan-Sephardi cluster between contemporary European and Levantine populations is of interest. This intermediate location is not surprising for Ashkenazi Jews, and might intuitively suggest some gene introgression from Central and EastEuropean host populations15. However, the overlapping location of Moroccan and Sephardi Jewish communities should be considered in the context of their historical chronicles. The traditional scenario suggested by historians to explain the establishment of these latter communities is as follows: 1) migration from the Levant to the geographic region corresponding to contemporary Iraq some 2,500 years ago, 2) movement to North Africa during the Arab expansion beginning in the 7th century, 3) movement through Gibraltar to the Iberian Peninsula to merge with and probably overwhelm any small pre-existing Jewish community from the Roman era, 4) expulsion of an estimated greater than one third of the population from the Iberian Peninsula in 1492 (Spain) and 1497 (Portugal) ACE, and 5) re-settlement throughout the then existing North African Jewish communities or establishment of new Jewish communities such as the Turkish and Bulgarian communities under Ottoman rule. Therefore, the clustering of Sephardi and Moroccan Jews is not surprising, but their clustering so tightly with Ashkenazi rather than Middle Eastern (Iran, Iraq) Jews and not with their host populations is surprising. It is also noteworthy that previously reported mtDNA analysis showed that four maternal lineages underwent dramatic expansion as part of the demographic history of Ashkenazi Jews, and these lineages were also found exclusively among Sephardi Jews, but were not present in non-Jewish samples. These results might suggest either shared ancestry prior to the events leading to the generation of these Diaspora communities, or a previously underappreciated level of contact between these communities. An additional scenario might be Central-Eastern European genetic introgression into Ashkenazi Jews and an Iberian-European gene introgression into Sephardi Jews. According to this formulation, a potentially homogeneous European genetic variation would have generated the genetic proximity between the Jewish communities, with the detailed geographic sources within Europe being different. Note that contra Atzmon, they are looking at the data and speculating about Central/East European admixture. This is a consequence of an over-reliance on PCA which, like Fst, is mindlessly used by populations genetics, over-interpreted, and ends up yielding information of limited usefulness. What would be better – if it is possible – are “admixture” analyses that could distinguish northwest, southern, central, and eastern European genetic contributions, and then determining how much of each type is present in the Ashkenazim (and Sephardim). 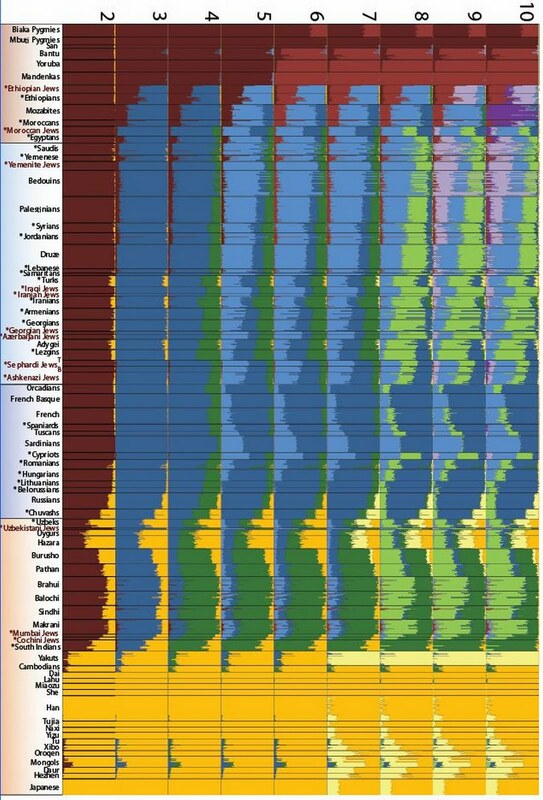 Just looking at placement of groups along a couple of principal components of variation, in a manner which is very context dependent on populations used, cannot determine why a population is where it is. Further, actual gene sharing analyses (e.g., Atzmon’s IBD analysis) is much more relevant to genetic interests than abstract placements on these graphs. Even more to the point, higher order genetic structure is not really being considered in these papers. If it was, I’d suspect greater differentiation between continentally defined groups. The Atzmon and Behar studies are indeed useful. But they are, in my opinion, flawed by the conformist tendency of population geneticists to use certain metrics as the foundation of their work when these metrics leave much to be desired. Do any of these people using Fst for example ever address Jost’s criticisms? Ted Sallis (email him) writes on scientific issues.